In the fifth century C.E., people from tribes called Angles, Saxons, and Jutes left their homelands in northern Europe to look for a new home. They knew that the Romans had recently left the green land of Britain unguarded, so they sailed across the channel in small wooden boats. This warlike dragon figurehead is from a ship of that time. The Britons did not give in without a fight, but after many years the invaders managed to overcome them, driving them to the west of the country. The Anglo-Saxons were to rule for over 500 years. Some objects were left behind by the Anglo-Saxons which have given us clues about how they lived. 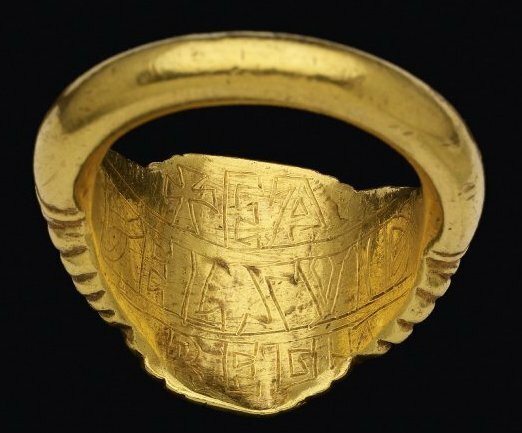 The British Museum is home to the largest and finest Anglo-Saxon collection in the world. 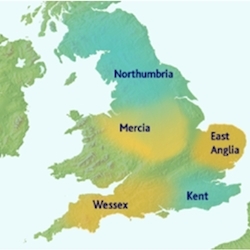 Anglo-Saxon England was divided into the five main kingdoms of Wessex, East Anglia, Mercia, Northumbria and Kent, each with its own king. Kings often died early and violent deaths. As well as fighting against each other for power, they had to keep their own nobles happy, or they might rise up against them. One way that they did this was to give them expensive presents. The ring on the left was perhaps given to a noble by King Æthelwulf of Wessex. The other ring has AD on it which stands for “Agnus Dei” meaning “Lamb of God” in Latin. On the back the name Æthelswith has been cut. She was Æthelwulf’s daughter and the ring might have been a gift she gave to show her favour. Cite this page as: The British Museum, "Anglo-Saxon England," in Smarthistory, February 28, 2017, accessed April 21, 2019, https://smarthistory.org/anglo-saxon-england/.